You’ll see banners like this all the time, this one at a rest area along the Garden State Parkway in New Jersey. In an effort to do them cheaply, they have used vinyl for the graphic. Over time, it stretches and curls on the sides, giving a terrible presentation. 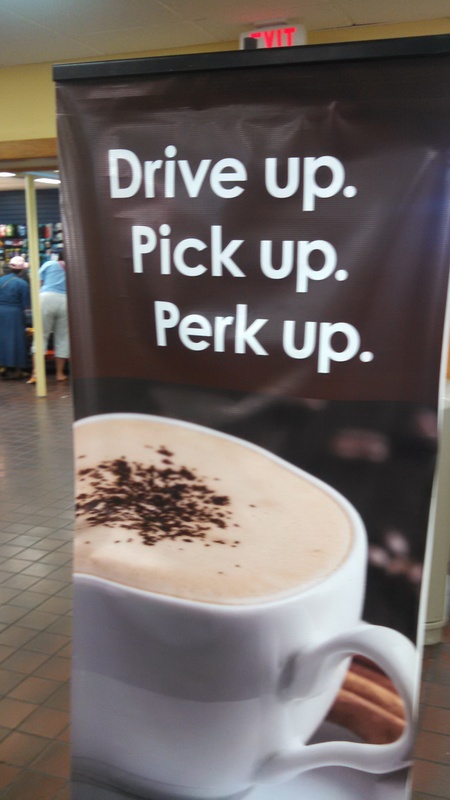 I’m sorry, but it seems to me that the couple of bucks it would have cost to do it right would long ago have been made back by selling more coffee with a fresh, flat banner that makes you thirsty for another cup of coffee. That’s why we print on a film for our banner stands. We’ve had a few of them up in the back of our shop for several years now, flat as the day they were made. The film we use doesn’t stretch, so they stay flat. It costs a few bucks more. When they sell more product for you, you’ll find our banner stands are worth it. This entry was posted in Banner Stands and tagged banner curling, food displays, restaurant displays, retractable banner stands. Bookmark the permalink.